A billboard containing air-purifying technology currently on display in London could clean up filthy air in the surrounding area. Advertising set up in Knightsbridge by media company Urban Vision consists of multiple layers of fabric which are designed to absorb harmful pollutants in the air. 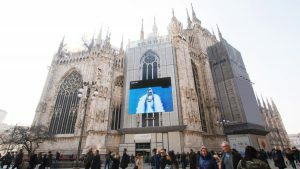 The billboards, which are powered by The Breath technology, are said to be able to remove nitrous oxides, sulphur oxides and particulates from the air within a 25 metre radius. The technology has already been tested out all over Europe in the last 14 years, including projects in Rome and Milan. In London alone, air purifying billboards have been used in Leicester Square, Piccadilly Circus, Uxbridge and Waterloo. The money raised from the 226 square metre site will fund the restoration of the 1930s Princes Court Building on Brompton Road – where the billboards will stand.